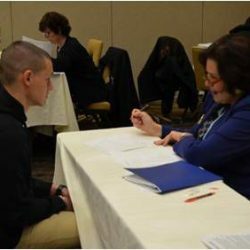 Berks Connections/Pretrial Services (BCPS) is looking for volunteers to assist at the Returning Citizens Career Fair on Monday, October 9th at the DoubleTree by Hilton, Reading, PA.Volunteer Shift Times:9AM – 12PM11AM – 2PMIf you are interested in volunteering or have questions, please contact Tiffany at [email protected] or 610-478-6920 X 3933All volunteers will receive lunch and brief training upon arrival. Join us in providing hope, opportunity and second chances.Your help is greatly appreciated!At our last career fair, more than 20 individuals were hired on the spot with many more obtaining employment in the weeks that followed as a result of the connections made at the fair! Many volunteers will be needed to help in the following areas: Registration, job application assistance, and general job readiness coaching and support.